What I am terming “reenactment” does not adhere to the strict definition that historical battle reenactors employ during their performances or the definition that artists who clone performance art (as in Abramovic’s Seven Easy Pieces) abide by. “Reenactment” is generally described in terms of a replay of specific events, wherein as much accuracy is maintained as possible. People who reenact historical battles use documentation in the form of diaries, photos, memoirs, government documents, etc. to create a scene that is as near to the original as possible. They are attempting to “touch the actual past” by posturing themselves in as “true” a way as possible. For example, the homepage for the 28th Massachusetts Volunteer Infantry 4th Regiment reads, “Have you ever felt a desire to somehow travel back in time?” This type of performance sees reenactment as a way to access what documentary evidence cannot – live experience. Through live experience, actors are attempting to do a number of things: redefine the past, define the present, and (paradoxically) to memorialize the past. In the art world, “reenactment” generally refers to the duplication of performance pieces. In the case of performance art, as well as of historical battle reenactment, the action is intended to be as specific and exact a copy of the original as possible. The aim is “authenticity”. Keeping these approaches in mind, I’d like to step back for a moment and point out something we all know, even if we know it subconsciously. Everything we say, and most of what we do is reenactment. That may seem like a broad, sweeping statement, but this is a touchstone of semiotics. Language is reenactment. Bodily practice is reenactment. Performance is simply a more highly articulated and specialized (staged) form of the reenactment we carry out every day. If one broad definition of reenactment encompasses our everyday language and bodily practice, another broad definition of it would assume that nothing is reenactment; that each moment, no matter how meticulously it strives to reenact, is a singular confluence of time, space, identity, and emotion. A practice that is both everything and nothing offers a whiff of what I am preoccupied with: the liminal zones of time/space, war/domesticity, and art/life –the bleed margin where one thing turns into another, where it is both and neither. If we keep in mind these broad definitions of reenactment, they inform the more specific definitions given to the term by reenactors of battle, reenactors of performance art, and reenactors of identity and gender. I am discussing a reenactment that spans these disciplines and leaks into the (re)enactment of life. Allison Smith is not engaging in the same reenactment that Civil War actors engage in. Rather, she is using their theater as a template for grafting an old “Civil War” onto a present event. Her Civil War is at once its own event (The Muster) and at the same time it is touching and pulling from both the original musters that occurred during the Civil War of the 1860’s AND the many reenactments of Civil War battles played out through the 20th and 21st centuries. I am referring to a reenactment that is a spongy performance, where space, time, and identity are permeable and accessible. Smith performs a (re)enactment that she calls “trench art” and that Rebecca Schneider describes as “wartime-art dug out of the spaces between times, between fields of inquiry, and between media.” This de finition can also apply to Stephanie Syjuco’s Afghanicraftistan. Syjuco’s project reenacts a domestic wartime activity that is still occurring in the present – the weaving of weaponry motifs. Afghani women have been weaving “war rugs” for the past 50 years that incorporate the iconography of war into a centuries-old tradition of rug weaving. What is altered in Syjuco’s performance is not time, but space. She is performing an act in a different geographic location as an act of solidarity and of doubling. The weaving itself is a metaphor for the channels of space and time that we all navigate by taking part in culture. I will be writing more on this idea in the coming months, and thinking about how Smith and Syjuco subvert conventional notions of craft, war, reenactment, performance, and trauma. The tactile artifacts that their projects have generated will become part of a history that dates back to the present, and they may alter the way that both the American Civil War and the Afghani wars are remembered. Certainly there has been a resurgence of the idea of reenactment in recent years across mediums. Frohawk Two Feathers and William Blake are two contemporary artist who are working out historical revision through painting. 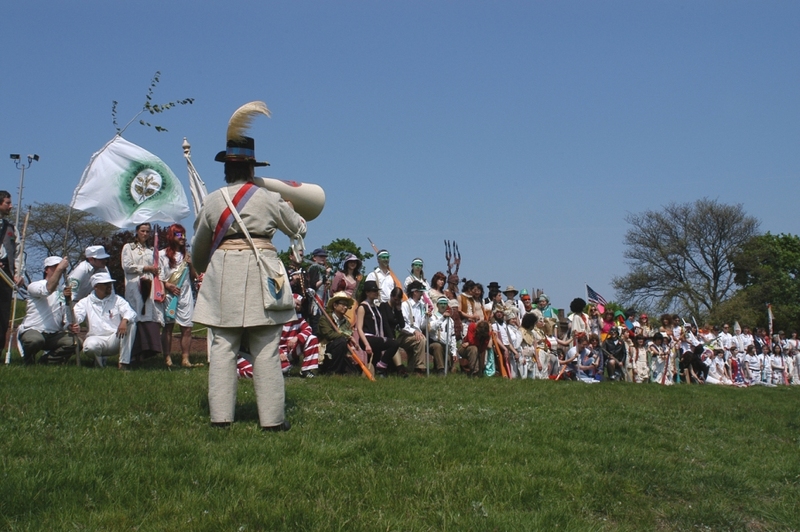 Jeremy Deller’s The Battle of Oregrave project is an example of a high level of specificity being used in reenactment performance, which is more akin to actual battle reenactors. Lisa Woolfork writes on “bodily epistemology” through reenactments of slavery. Robert Jackson writes a great article on the topic of reenactment in contemporary art, Once More, With Feeling: Reenactment in Contemporary Art and Culture.